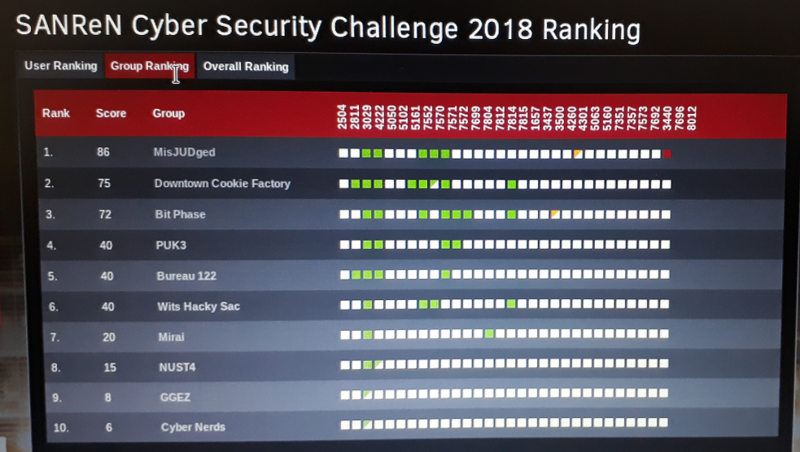 SANReN is hosting its second Cyber Security Challenge during the CHPC National Meeting 2018 at the Century City Conference Centre in Cape Town from the 02 to 06 December 2018. The Challenge is currently in full swing and competition between teams is rife. The current ranking at 15h20 on 03 December 2018. Team MisJUDged is in the lead. The purpose of the competition is to stimulate interest in Cyber Security in the field of network security within South African Tertiary institutions. Thus, the competition is aimed at university students who are interested in information security fields such as penetration testing, incident response, digital forensics and security training. During the competition students will be exposed to real cyber related threats. Due to the high interest among students the competition was split into two rounds. In the first, qualifying round, students competed for placement and a chance to compete in the final round at the hosted event in Cape Town. Of the over 200 students from over ten universities that sought a place in the final round, only 40 were placed. Which one of these teams will be crowned the winner?